With the new school year, Gabe has decided to quit the choir, writing Mrs Q a resignation letter. He has remained under her charge though, as he has joined the school recorder group and orchestra. So now he sings everywhere but the choir. His current favourite song has been learnt in German class. 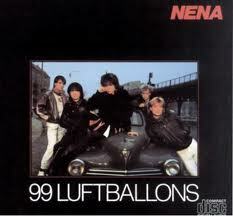 He sings the ’80s euro-rock hit, ’99 Red Balloons’, in its native language, in which the balloons aren’t red but airy. Robin turned to talk to me when I came in from work. With his mouth full of carrot, I couldn’t make out what he was saying. ‘Yes’, L said, ‘he really did nearly die.’ Coming home from school, riding his bike, Robin had turned to wave at L and Eliza, lost control of the bike, ridden off the pavement and fallen into the road. Tyres screeched and he narrowly avoided getting run over. L said her legs were still shaking when I saw her over an hour later. Eliza has the tidy gene. She keeps her bedroom ship shape. She folds her clothes before putting them away, returns books to the bookshelf and doesn’t allow toys to overflow their boxes. She even carries out missionary work, helping Robin tidy up his bedroom. It was only a valiant and uncharacteristic effort from Robin that stopped Eliza winning this week’s Strictly Come Tidy Bedrooms contest. Eliza eats food slowly if she doesn’t like it, spinning out the meal, hoping to be spared it. Eliza eats food slowly if she does like it, savouring and delighting in it. Eliza’s slow eating can be because she gets distracted, by chit-chat or by a game. It may even be because she has a small mouth, or is missing teeth – but she ate slowly with a full mouth of teeth, too. Ice cream cornets have posed a particular challenge. Her favourite food can be lost if too much time is taken over it. This she has finally grasped, but still every cornet is a cliff-hanger. With the end of summer, Robin’s junior football practice has moved inside. Robin has been insistent that he doesn’t want to play indoors and was refusing to go. His motivation, it seems, had been to get boots with studs, which couldn’t be worn inside. He wanted to know when he could get them and asked to look at catalogues of boots on the computer. L turned up an old pair of Gabe’s, three sizes too large. Robin enthused over them. He disappeared from the kitchen to hold them, look at them, stroke them. I tied the laces for him to wear them in the garden. He padded around, not quite tripping over his clowns’ feet, scuffing the football. This morning, heavy rain and more forecast convinced Robin to return to football indoors. He scored, enjoyed himself and may be reconciled to waiting until his feet grow until he returns to the football field. After our successful trip to Rome, L and I have talked to the children of doing something similar next year. Gabe wants control and has been regularly checking the Eurocamp website to check possible venues. He calls us into the study to see the latest perfect site he has found, pointing out the pool or, maybe recognising his audience, the landscape in which it is found. All the time trying to get commitments from his non-committal parents that this is where we will be going. Robin has started school. He’s three days in – two short days and today his first full day. All has been smooth, but he was subdued after day one. L couldn’t get an explanation, but we wondered whether it had felt an anti-climax: no great change from nursery. Robin is refusing to wear the school sweatshirt. He hates jumpers, he told me, having asked me to help him take it off, seconds after the teacher had made him wear it on leaving school on day 2. So he wears a polo shirt and traditional grey shorts that stretch down over his calves. They’re very eye-catching. Eliza has been moved to a new gym class. She’s the smallest, slightest and palest of a group of 20 girls aged up to 15. She holds her own in this company. On Saturday I saw her doing floor exercises and vaulting. She did a forward flip over the vaulting horse with straight arms and straight legs. It had been the first time she had been asked to do one. Two swimming pool visits in two weeks and two angst-ridden melt-downs over swimming trunks. The first over whether new trunks would be ‘acceptable swimwear’ – they were. The second over the state of his other pair of trunks which were spotted with tissue paper residue from the washing machine. Gabe knocked off the following poem for his homework in a little over 15 minutes under pressure of missing something on tv. when you didn’t eat your greens! For the past few weeks, Eliza’s pale, thin body has been dotted with moluscum – small warts. They’ve clustered at the tops of her legs and their itchiness can make her miserable. They are becoming redder, which may mean they’re about to subside. 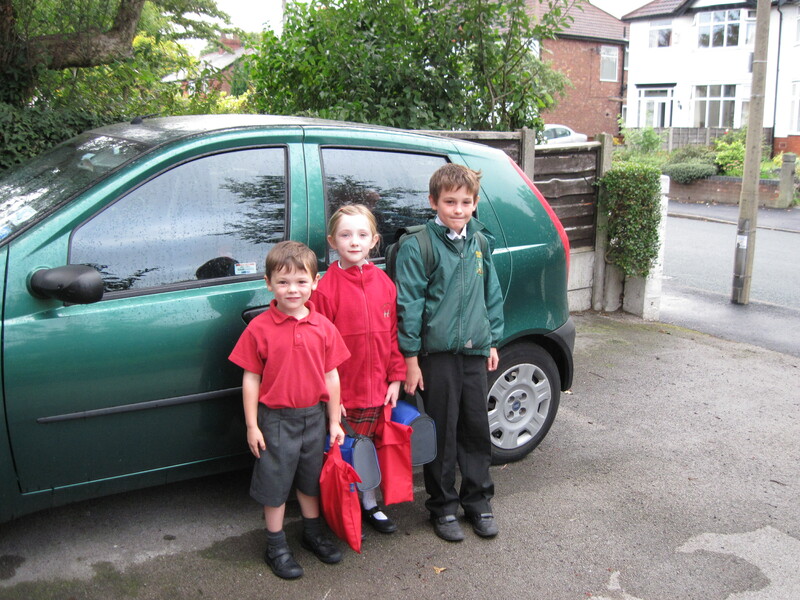 Robin wore his new school shirt, shorts and shoes to pick up Gabe and Eliza from school on Friday – a few days before he starts in reception. He skipped down the road from the infant school, tripped and thudded his head on the pavement. A graze and a bump remain on his forehead. Eliza won the right to look after her new class teacher’s stick insects for the summer holiday. Initially, Eliza was keen to play with them: taking them from their enclosure and holding them while they swayed and bowed to music. Her mood changed when one of the three insects died. She was fearful of killing her teacher’s insect collection and became reluctant to hold or touch them. Then one day, she spotted a baby stick insect and a week later another one. All looks set for her to return to school with a net increase in stick insect population. So often carefree or brave, Robin has a fear of dogs. In the park he scuttles back to us when he sees a dog coming and cowers by my or L’s legs. He’s not suffered a fright that could explain this reaction and it is as severe for small dogs as it is for the many breeds that stand taller than he. Gabe has a deep-seated need to follow rules, even ones that only exist in his imagination. An infraction to which he is a party causes him enormous angst. I signed him up for an on-line game using a made-up email address – not wanting to use my one and his own was already registered but he couldn’t remember the password. He sobbed and fretted about what I had done – stealing someone’s email address – refusing to play the game, until I agreed to submit my own genuine email address.